Please note, our video requires Flash. You can download it here. Hey there, it's Harry Dent. As I just mentioned in the video above, a lot of people are looking for answers when it comes to where to invest their money, or what kind of business they should start. Especially now that we're seeing the financial markets take some violent twists and turns that have us teetering on the edge of massive collapse. You may even be one of those looking for answers. and more importantly, who they can trust when it comes to financial information. And quite frankly - given today's turbulent market conditions and my predictions for the next 20+ years - it truly is a must-have resource for every serious investor, business owner, and self-employed professional. Now if you're familiar with any of my work, then you already know that those who've read my books and followed my research for over the past 20 years have been able to make a considerable fortune for themselves, and preserve their hard-earned wealth. "Harry Dent has been our chief strategist for over 15 years. and also took my advice to get out of the stock market in 2008 before investors lost up to half their wealth. it was usually the complete opposite of what all those so-called financial experts were saying! 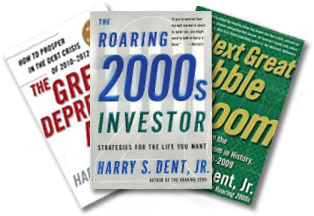 In 1989, I wrote The Great Depression Ahead, which was the only investment book that predicted the Japanese market crash and that country's multi-decade depression that would follow. Then, just three years later in 1992, when everybody and their brother was all "doom and gloom" about the markets - I wrote The Next Great Bubble Boom which accurately forecasted Americas biggest 16-year bull run, pinpointed the peak between 2003-2007, and warned that in 2008 it would all come to an end. and for those who didn't have access to my research or act on my warnings - it wasn't a turn for the better. And in my recent book, The Demographic Cliff, I stood alone in predicting that our current financial bubble that overinflated the Dow up over 18,000, was set to burst by 2015, sending stocks plummeting, interest rates soaring and real estate, gold and oil crashing. And as it's plain to see now, we're most certainly seeing a historic financial crisis beginning in America. Now its important to know that I made these predictions NOT because I'm an eternal contrarian, or that I just like to go against the grain to get publicity. In fact, the sole reason I have made such unpopular or seemingly far-fetched predictions over the past 20 years that have ultimately come true is because I was merely following my extensive research to its logical and most probable conclusion. And I did it by tracking just one key indicator, which I'll tell you about in a moment. and then do the opposite!"
Well I'm here to tell you - it's absolutely true. As you're well aware, we're going through some very turbulent financial times right now, and I predict it will get much worse. While my publisher and I have received rave reviews for that best-selling book - we started to notice a theme in the questions and comments from readers. So that, coupled with the fact that I wanted to put an end to all the confusion caused by all the so-called financial experts spouting their untested theories, prompted me to finish the be-all, end-all financial guide for the next 20+ years. especially those between the ages of 40 and 65 because they're either planning for retirement, or they're already entering their retirement years. If you happen to fall within that age group, you may be one of those concerned individuals. ... especially those between the ages of 40 and 65 because they're either planning for retirement, or they're already entering their retirement years."
- Harry S. Dent Jr.
Consequently, it just so happened that many peoples concerns were coming at a time when I was close to completing this financial guide. And then meticulously filtering that data into useable and easy-to understand charts, graphs, and summaries to create this new financial guide. We've titled it - Spending Waves: The Scientific Key To Predicting Market Behavior for the Next 20 Years. ... and those who use this research over the next several years could make a substantial fortune, while others will be left behind losing their shirts as this historic financial meltdown takes hold. or staying glued to your computer researching where to invest your money. and in just minutes, you'll know whether it's a good move or not. It could also give you an unfair advantage over other investors and business owners because you'll know when large numbers of people are projected to purchase various types of products and services over the next 20+ years. If you've followed my work at any time over the past 20 years, you'd know that my one key indicator to determining how the financial markets will rise and fall has to do with demographics. More specifically, how and when certain segments of the population buy things. While on the other hand, most economic trends are driven by people's consumption patterns. and how much they're buying. ... and what they'll continue to purchase as they enter retirement. But recently, we've taken our research a step further and began tracking and projecting the buying behaviors of the tens of millions of people who are in Generation X, and those in Generation Y (also known as the Echo Boomers). ... giving you the opportunity to see into the future - as if you were looking into a crystal ball. As I mentioned earlier, if you're a serious investor, business owner, self-employed professional, or even just someone who likes to keep their finger on the pulse of the financial markets - you'll want to keep a copy of this research readily available. when to get out for maximum gains. The Six Crucial Steps you must take if you own a business (even if it is a small one-person business you run from home) during the coming period of deflation. Exactly why 'demographics' is the one key indicator that drives all bull and bear markets, and how understanding them could make you a fortune over the next 20 years. 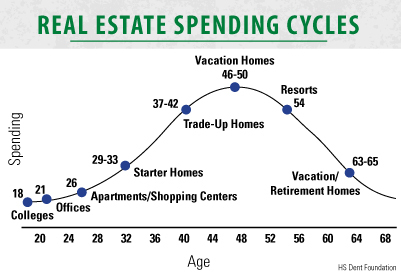 Why you should downsize your home right now instead of waiting another 2-5 years (Ignore this at your own peril). but over a dozen different industries you may have never even thought about!). Why the mantra for successful real estate investing is still "location, location, location" but if you overlook this new key factor - your appreciating cash-producing properties (or even your own home) could turn into debt-ridden nightmares. How to capitalize on the next "Baby-Boom" and ride this profit wave for the following 30 years (Their buying patterns will be just like those of the Baby Boomers). no matter how much extra cash you have available! and how it can be your indispensable go-to reference for your investment or business decisions. And I think you'll quickly see this as the only financial guide you'll ever need. In fact, recently, I spoke with a college student majoring in business and he told me that his business and economics books cost him over $500 for just one semester. And those are books he'll probably never refer to, or use ever again! When working with my publisher, we wanted to make my extensive research much more affordable. ... you'll be able to get all of my best and most up-to-date financial research for just $149 (plus shipping). That's less than the cost for just a single college text book these days. So keep this guide for 60 days - read it, explore it from cover to cover over the next two months. This is plenty of time to check out the dozens of investing and business secrets contained inside. and I'll send you a full and fast refund. once all the copies are sold out, theyre gone. So I encourage you to grab your copy today and look it over for the next 60 days. It could be one of the best investment decisions you ever make.